With its 5.5 inch screen, Infinix Hot Note is a quite large smartphone with non removable battery. Need a free unlock code to unlock your phone? The 0.9cm thin and 170 gram phone feels steady but makes it not easy to use with one hand and won’t fit well in your pants pocket. 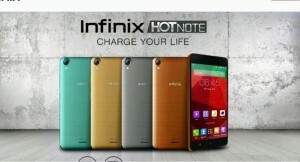 Infinix Hot Note body was built with plastic material horizontal pattern on its back side adds a classy looks as well as rough feels. All three menu buttons on the front side are without backlight. Infiinx Hot Note comes with android KitKat 4.4.2 but the UI is surprisingly feels very lite and only consumes about 600MB of RAM. Press the Home button for 2 seconds to display all running apps and information about RAM usage, this means the phone doesn’t support Google Now Despite its lite UI, Infinix Hot Note still has gesture and tap to wake feature. Just tap the display twice to turn on the screen from its idle state. There are 8 gestures to run dedicated apps or functions i.e. simply write the letter “C” to instantly access the camera from idle screen. The lite and simple UI also comes with humble interface display, there are no themes or transition effects options available. Infinix Hot Note is an entry level smartphone the US$114 price tag is very reasonable with its fair performance. With MediaTek MT 6592 1.4GHz octa-core CPU and 2GB RAM, games like Implosion can run without lag but when running games like Modern Combat 5, we feel the performance goes a bit lower. The screen resolution is really helpful to the gaming performance. This phone has 5.5 inch and 1280 x 720p display which delivers sharp images but it feels a bit too bright and uneasy to look at in a long time. Even so, Infinix Hot Note manage to play a 720p and 1080p video in 60 fps with its 30 fps default unfortunately the speaker can’t handle maximum volume level. Battery is clearly a strong point of this phone. With its quick charge capability, the 4000 mAh battery can be charged from 0-50% in just 30 minutes and just 1 hour to fully recharge it. The battery can power daily usage with 1 active SIM card for up to 2 days from its fully charge state. Infinix Hot Note provided with a 8 MP main camera, 9 photo creavite modes burst mode up to 99 shots in one click also voice and hand shutter to take pictures. There are photo frames to add unique touch to your photos. You can really rely on the camera point and shoot responsiveness.There you have it, the plus and minus of Infinix Hot Note.